St Johns West Bend – Our Time is NOW! You may be familiar with this phrase as the rally cry for the St. John’s West Bend Foundation this year as well as a call to action to St. John’s members to consider assisting in a prayerful financial response to help pay for the substantial cost of recovering from the natural disaster that befell our church and school this year. This flood has a huge impact, both through volunteer hours committed and the high financial cost of the recovery, on the life of the church. The St. John’s West Bend Foundation continues to encourage each member of St. John’s to pray for the Lord’s guidance in offering a contribution, above and beyond first fruit giving, to assist in covering the cost of recovery from the flood. We expect the final tally for repairs to be approximately $200,000. This amount would have been much higher if it had not been for the tireless efforts of volunteer and staff going above and beyond to aid in clean-up. Praise the Lord for those who gave so much of their time and talent in helping to quickly restore the church basement, the ECC, and the school. Praise the Lord as well for those who have contributed financially towards the recovery so far. We are nearly 70% complete towards the goal of $200,000 needed to pay the financial commitments of the recovery. 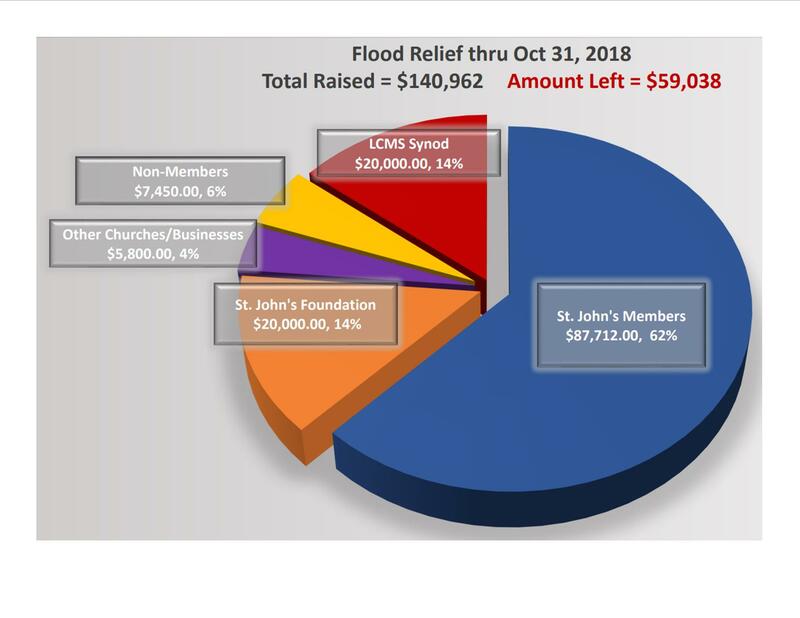 As you can see, on the graph, a generous gift of $20,000 was made by the LCMS Synod Disaster Relief, as well as generous gifts from non-members, other churches, and businesses. In addition to the Foundation’s lead gift for flood relief of $20,000, approximately 148 families have been led by the Lord and donated over $83,000 so far. For this, we thank God. However, there is still close to $60,000 left to cover the cost of this disaster. There isn’t a large flood insurance check waiting to be cut, and we are certain that God has raised up all of the generous outside resources available to us. The remainder of the cost will need to come from the family of St. John’s. This is the Lords house, and our house. While it needed to be fixed quickly, the expense of these repairs is very real and needs to be covered. We are not asking you to give more than you are called to give, but rather we are asking for more of you to pray to the Lord for guidance on what you should give beyond what you had planned for the year. If that amount is $25, $50, $100 or more, no matter the gift, it can help us close the gap on what is remaining of this large, unexpected cost. If we cannot raise the required funds in the next several weeks, we will need to consider taking on additional debt to pay what is owed. There are many ways in which you can help in this recovery effort. In the church pews, and at the church office, you will find blue envelopes marked with the St. John’s West Bend Foundation logo and stamped “Flood Relief.” Please prayerfully consider what it is you can give above first fruit offerings and place that donation in the blue envelope and include it in one of the collections over the next 4 weeks. Also, you can visit our website and click on the giving tab at the top of the page. Make sure to designate your gift to “Flood Relief.” You can also visit the St. John’s West Bend Facebook page, where you will find an easy to use donation button that allows you to give a gift through Facebook, and you can share the page with your friends who may wish to donate quickly and easily as well! Our time is now! There is a big task ahead of us but no task is too hard for God. For questions, contact Craig Toerpe at 262-334-4901 or ctoerpe7@gmail.com.